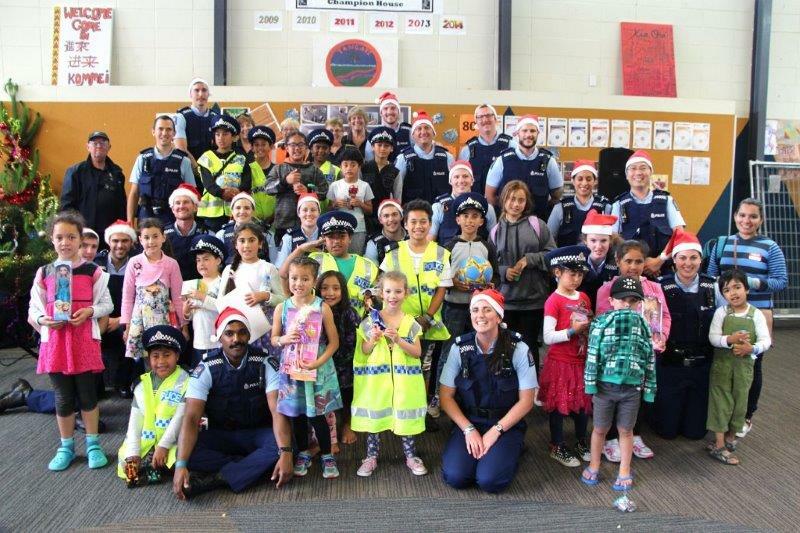 On Saturday 24 November, Rotary Club of Plimmerton ran its annual Police Recruits and Porirua Kids Christmas party at Porirua College. It was organised by Ian and Terrie Turner with support from thirteen other Rotarians. The club hosted thirty-one children from Cannons Creek School and Corinna School, two of the lower decile Porirua East primary schools. Each school selected children based on home circumstances. Rotary arranged a bus to pick them up and took them to Porirua College to link up with the uniformed recruits. 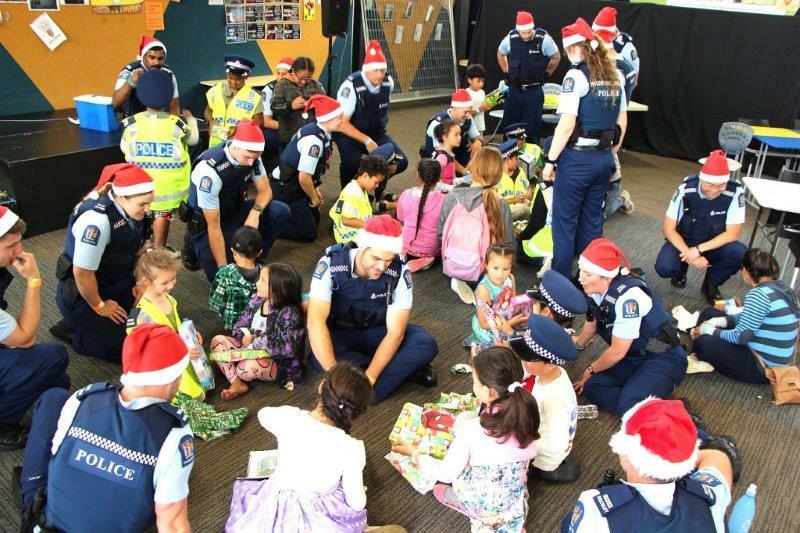 The objective of the project is to provide a positive police experience to kids who may have had a negative experience with police in the past, to build trust in the blue uniform and to provide a Christmas treat for children from families that may not be in a position to provide one themselves. Nineteen police recruits had volunteered with enthusiasm to attend, even though their final exams are just two weeks away. They were accompanied by their training sergeant. What an experience it was! The recruits and kids had a marvellous afternoon. They started with simple games like sack races, cricket, touch rugby, egg and spoon races, and a giant wooden jigsaw puzzle map of New Zealand made by Ian Turner. The recruits soon grasped the opportunity to simply have fun with their young charges. Very quickly, police hats were on young heads and Police fluorescent jackets were being worn with pride even though they reached below the knees of the young wearers! After the outdoor games, it was touching to see several of the kids leaving the field, hand in hand with one of our future ‘men and women in blue’ to walk back inside together. All of them were happily engaged in conversation and jokes with their new-found Police friends. A beautiful lunch was provided by the Porirua College canteen staff, followed by great entertainment from “BJ Bear” (Brent Jupp of Applause Entertainment). BJ Bear is very funny and his stories have hidden messages, making him a fantastic speaker to motivate the children. Finally, the recruits donned Santa hats and handed out a small gift for each child. This has been a fantastic opportunity for Rotary to provide the organisation and means of community engagement between the kids and recruits bringing huge benefits to both the kids and the recruits for whom assisting young children will soon be a part of their day-to-day work. A huge thank you goes to Porirua College for their catering and the free use of their facilities when they learned that we were unable to use our usual venue at the Police College due to building work being in progress. Thank you also to the Royal New Zealand Police College and the Police recruits without whom this project would not exist. And finally, thanks to Graham Craig for the excellent photos. (Terrie is organising for the recruits’ training sergeant to visit the club). Original generation time 1.8613 seconds. Cache Loaded in: 0.0005 seconds.